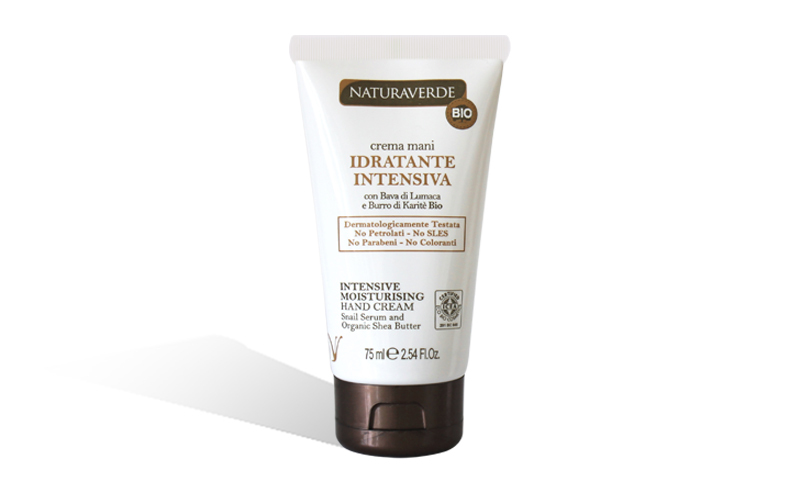 La Crema Mani Naturaverde Bio grazie alla sua formula arricchita con Bava di Lumaca idrata intensamente le mani lasciandole morbide e delicatamente profumate. Particolarmente indicata per pelli secche e screpolate. Aqua (Water), Cetearyl Alcohol, Glycerin*, Glyceryl Stearate SE, Snail Secretion Filtrate, Isopropyl Myristate, Caprylic/capric Triglyceride, Ethylhexyl Stearate, Prunus Amygdalus Dulcis Oil (Prunus Amygdalus Dulcis (Sweet Almond) Oil)*, Butyrospermum Parkii Butter (Butyrospermum Parkii (Shea) Butter)*, Olive Oil Decyl Esters, Aloe Barbadensis Leaf Juice*, Squalene, Behenyl Alcohol, Xanthan Gum, Tocopherol, Helianthus Annuus Seed Oil (Helianthus Annuus (Sunflower) Seed Oil)*, Sodium Phytate, Citric Acid, Phenoxyethanol, Ethylhexylglycerin, Parfum (Fragrance).